Powers up to 45 minutes of laptop runtime for every hour in the sun. Voltaic Systems today introduced a complete redesign of its Generator Solar Laptop Charger, featuring 16.8 Watts of rugged solar power, a 60 Watt-hour universal laptop battery and a streamlined, protective case. The new Generator is now also more affordable at $399. Designed for mobile workers on the move, the Generator provides up to 45 minutes of laptop runtime for every hour in the sun. It will power most modern laptops, tablets, professional digital cameras, and smart-phones. Even when solar charging is not an option, the internal battery holds enough power to more than double the runtime on many laptops and can also be re-charged from the included wall charger. Integrated into the front of the Generator is a rugged 16.8 Watt solar panel. Run times will vary by laptop, but these high-efficiency monocrystalline cells will power a MacBook Air for 45 minutes after 60 minutes in the sun. The cells are encased in a clear, UV and scratch resistant coating, and backed by a rigid aluminum composite material. The panel is waterproof and built to withstand the abuse of everyday use. The Generator is designed to store and manage a wide range of electronics. It has 575 cubic inches of storage space, a padded laptop sleeve, a document sleeve and plenty of mesh pockets for adapters and cables. The case is molded and padded to further protects laptops, and it comes with a removable shoulder strap. Just as importantly, a careful focus on design has produced a good looking bag that would not look out of place in the office. The included V60 battery has 60 Watt hours of capacity, larger than most laptop batteries. It will also charge tablets up to 2 times and smart-phones up to 8 times. The battery has two output ports: one for charging laptops and other 12-18V devices, and USB port for charging phones, tablets and other 5V devices. 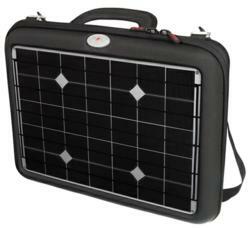 The Generator can become a MacBook Solar Charger with the addition of Apple’s airline adapter. To solar charge digital cameras, users can select from a range of optional camera cradles to connect and charge their DSLR battery. Voltaic was founded in 2004 to develop energy solutions using environmentally-intelligent designs. For more information please visit http://www.voltaicsystems.com, or contact us at 1.877.304.6861 x701 or media(at)voltaicsystems(dot)com. High-resolution photos are available upon request.